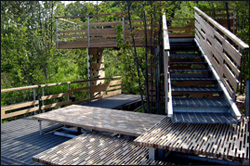 Wesleyan students built a bird-viewing platform for the Helen Carlson Wildlife Sanctuary in Portland, Conn. The architecture project, named SplitFrame, will be celebrated by a reception for the project at 2 p.m. Oct. 19 at the sanctuary. Imagine this architectural challenge: create a site-appropriate structure for a former cranberry bog covered with 3 feet of water; use durable and sustainable materials and construction technologies as extensively as possible; work within a budget and; make it optimal for observing Redwing Blackbirds, Scarlet Tanagers, Hooded Mergansers, and the occasional Great Blue Heron. Political scientists Daniel Drezner of Tufts and Elvin Lim of Wesleyan explore the appeal of politicians who shun intellectualism. Anorexics can be male, old, Latino, black or pregnant. A new book undercuts old stereotypes.